Even in July, a time when the monsoons offers some respite from soaring summer temperatures in India, the heat continues to blaze in Jaipur. There’s been no rain. The state, situated in the arid western fringe of the country is witnessing a drought for the second year running.At the Jawab Do Dharna, the fifteen day public event for accountability, organized by the Mazdoor Kisan Shakti Sangathan(MKSS), a sprawling tent propped up by wooden poles is the only thing that offers any protection from the oppressive temperatures.Undeterred by the heat, people have travelled far and wide to be here – and to be heard. 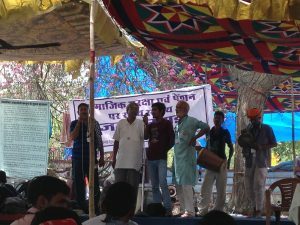 People are queuing up to have their turn on the stage and take part in the Jan Sunwai, a public hearing where citizens voice their grievances over a plethora of governance related issues – delayed pensions and reduced rations. They lay themselves bare in their stories, of being unceremoniously cut from welfare rosters based on faulty algorithmic decision making and inaccurate big data. Their collective outrage, frustrations and quest for justice echoes in a common narrative of disenfranchisement. In the crowds, MKSS interns and volunteers from the Digital Empowerment Foundation are working with the complainants to process and upload their grievances onto ‘Sampark Rajasthan’ a government grievance redressal platform maintained by the Government of Rajasthan’s Department of Information and Technology. To date, the online portal has been used by MKSS to track over ten thousand complaints on behalf of the complainants. These grievances will be taken to concerned local officials to negotiate reinstatement of welfare benefits. They are also being collated with a view to lobby for an accountability bill to be introduced to the state legislature later this year. Sometime in the early evening, as a discussion is in process, a sandstorm kicks up. Volunteers immediately run to hold the poles in place, holding the structure in place as it sways precariously from side to side. The discussion continues, indifferent to the vagaries of nature. Metaphors abound. This is democracy – imperfect, shaky and yet surviving. The Voice or Chatter Project which began in March 2016 under the MAVC program has been IT for Change’s effort at understanding the impact of ICT mediated citizen engagement on governance structures and processes. Working with a network of researchers, we look at nine case studies from Asia, Africa, South America and Europe to explore the ways in which ICT mediated engagement can be empowering for the citizen and transformative for the outcomes of governance. From our preliminary work and scoping in the project, a complicated picture of citizen engagement arises. This resonates with the experiences of policymakers and researchers alike, who have observed how similar ICT initiatives may elicit markedly different outcomes in different contexts – opening up new spaces for meaningful dialogue between government and citizens in one instance while amounting to no more than a token gesture in others. From the Marco Civil law in Brazil to the ‘crystal box’ initiative being undertaken in Colombia, a range of ICT mediated practices are being studied under the project that challenge and reshape existing meanings, norms and practices around citizen engagement. The conversations with our partner researchers have led to some insightful observations about the conditions under which ICT-mediated citizen engagement functions. In Spain, the connection between autonomy of local level governance and a push for municipalism as a form of resisting federal overreach reveals some interesting tensions between levels of governance and the ways in which they can shape larger forms of civic engagement. Initiatives that seek to promote a culture of transparency and participation such as the Open Government Action Plan (OGAP) in Uruguay and the ‘Open Data’ project of the Philippines’ government also help us in understanding how participation and citizen voice can be engendered in governance and lead to long term governmental outcomes. In India, our fieldwork tracking MKSS’ work with Sampark Rajasthan point to the increasingly important role that big data and ‘digital as default’ practices play in governance and the delivery of social and economic rights, offering us a timely window to examine how citizen voice is shaped in the context of such emerging paradigms. It has also opened up questions about the nature of collective action and representation through the use of ICT tools vs the continued relevance of earlier models of community organisation. For instance, Sampark Rajasthan has been set up with a view to transition all departments of the state government to an online-only grievance redressal mechanism. Where a group of villagers may have once been able to collectively negotiate issues with the local bureaucracy in person, registering a complaint online may force a more individualistic approach. The cases being pursued under the Voice or Chatter project present an opportunity to map the liminal moments of citizen engagement and understand if and how meanings around ‘participation’ and ‘voice’ are being fundamentally rewritten. Moving beyond a simplistic theory of change as an automatic outcome of digital participation, a more accurate picture of citizen voice negotiations begins to emerge. Inclusive citizen-centric institutional norms, rules and practices that guarantee democratic accountability in the age of data based governance thus becomes a key policy imperative. This piece was first published on the Making All Voices Count blog on 15th September, 2016 as part of International Day of Democracy.